In the world of electronic meditation there are many attempters and not enough true creators. But Kyron, I am pleased to say, delves in the right places and has the right attitude to this genre of music. It is a must to allow all possibilities to evolve good or bad. The must is in the allowance of such things and the other is not to have set aims to ensnare those possibilities which could have been but were not in the plan, so did not evolve at all, but could have been the best part of the plan, if allowed. 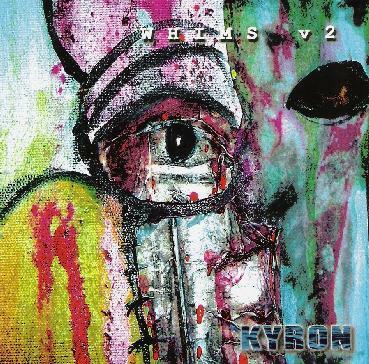 This is the nature of this CD and J.C Mendizable, aka Kyron, puts a similar quote on the inner sleeve - Whims was created in the manner that the title suggests, by following sudden bursts of creativity through their natural evolution. Through this process, many more possibilities were discovered. The music travels across barriers of category, harmony, and style, to find it's own answers and questions. So this is what you get and I know some may think that this means good stuff amongst churned out stuff. And I understand that point of view because in truth there are lots of Tangerine Dream albums that I think are poor. So you have to take it all in the way it is meant to be taken. And at the moment in time that Kyron produced this the hypnotic building of motions of sound seem to move along smoothly, and there does not seem to be any stand out parts in a bad way. So in the eyes of a subconscious music meditation freak I find it does a good job from start to finish, and this cannot be said for a lot of the CD's in this field. Kyron take trance induced pieces and explores what is possible, and what is not, and melds all of the ambiences created into a mindscape of music ready for the aspirant to explore. Everyone is different, and everyone will develop their own assumption and feeling for the music, and many will find different angles that they may love or hate. Yet this is the beauty of the music in question. There is no set way to indulge. Just let it take you where it takes you as the creator let it take him, and through this union find a path suited for the individual, even if it is diverse to the creator purpose, outlook, or assumption. Because in essence it is a trip on its own, out of everyone's hands, and hopefully becoming a planted concept in open minds. I find Whims electrifying and very earthy in its progression from beginning to end. And I also find it has a very fluent and crisp quality throughout its 15 tracks or phases. I also must praise the quality of the production, and also of the ideas of the phases themselves. And I must stress that it is more in depth than one fella pressing play on a sequencer, or note on a keyboard, and letting that be all that there is to it. Not like that at all. And even though some aspects may be ropey, on the whole it is put together with a vision of something rather than a collection of things that took no time to construct. Kyron shows just what experimentation is all about, and those of you who are into soundscapes and hypnotic ambience will surely get off on this and will surely meditate deeply upon it. Because that is the purpose of headphone albums... to cruise through the mind and visualize whatever you want to visualize through the music, and to relax, and allow the music to take you on your personal journey. Kyron is all this and it is very much what I like from electronic music. It is a project that I would like to hear more from in the future. And also in praise to Kyron's Label, Black Note Music, I have heard no shite from you. Only high quality and dedicated experimental electronic music. So to all involved, keep up the good work - performers and label personnel alike.